So while we were in Cornwall we had a lot of very delicious meals, fresh produce and generally top quality food. Being close to the sea, fresh seafood was of course readily available. I mentioned that giant bowl of fresh mussels at the local pub in my last post didn't I?! Amazing! When we go away we tend to leave most things unplanned as we very much prefer to get to a place and seek out the best that we can find or just wait until we stumble across something special once we arrive. On each trip though we will usually look into and book maybe one well known restaurant or local activity. For this particular trip it was lunch by the beach at Jamie Oliver's Fifteen. Fifteen is located on the beach front of the very beautiful Watergate Bay and if you're staying in this area, whether you intend to visit Fifteen or not, you must go and check out this very beautiful and famous stretch of the Cornwall coast. Where many surfers go to play, Watergate Bay is completely stunning. Unfortunately you'll have to take my word for it as the day we visited was so very windy that I didn't get enough pictures of its beauty. I think I'd taken so many beach photos by this point I was a bit beach photo-ed out! If you're not aware of the premise behind the Fifteen restaurants both in Cornwall and in London, the idea behind both locations is to help to nuture and train apprentice chefs and staff looking to find their way in the food industry. Fifteen Cornwall is owned by the Cornwall Food Foundation and the apprentice training programme run by the restaurant is mainly funded by the restaurants own profits. So your visit really does go a long way to contributing to this programme and helping to change young lives for the better. 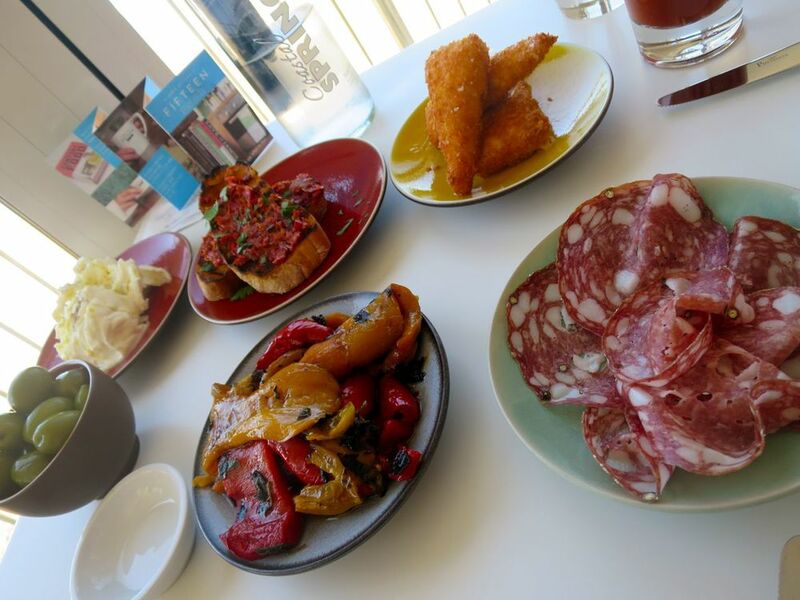 Italian inspired, locally sourced ingredients play a major part on the menu here. The beachfront location ensures a wonderful view of the shenanigans on the beach below - cue us watching intently as a Father attempted to fly a small kite in the bustling wind for his daughter, a man attempted unsuccessfully to kite surf and one extremely happy dog did sooo many laps of the beach in such a short space of time that it took our breath away! Try if you can to get a table by the glass front of the restaurant and its exceptional view, to enjoy the benefit of such a spectacular spot. We chose to visit at lunchtime and were told by many approving locals that this was the best time to visit in order to get the best of the view and to enjoy the best of the bay. Booking in advance is advised as this place is pretty popular and can get very busy. To start we went with the chefs selection of seasonal antipasti and were very pleased with the array of fresh delights that arrived at our table. The huge chunk of fresh Burrata cheese - oh my! Just mouthwatering. The only slight disappointment were the olives as we personally didn't really feel that a bowl of olives really constituted as a proper dish for a starter. However upon mentioning this to our server this was very quickly remedied and we really appreciated the understanding and responsive service. Of course fresh fish is going to be one of the main draws at a restaurant like this and for that reason I went with the local turbot for my main course. Fresh and beautifully cooked, balanced with subtle flavours of broad beans, pea shoots and a little parma ham (if I've remembered the finer details correctly) it was one of those dishes that looks truly beautiful as well as delivering a real punch of taste and delight as well. To keep the balance Dan chose to sample some fresh, made in-house, pasta with beef rib ragu and yep it really did melt in the mouth as anticipated. After grazing on the fresh antipasti and making our way through the mains we really didn't have any room left for dessert - I think we were also a little cream tea-ed out by this point anyway. So we sipped our drinks, me a glass of Prosecco, Dan a tomato juice with all the trimmings and apparently a very good one to boot, then made our way home, full and happy from a lovely afternoons dining and sightseeing. Fifteen is definitely worth adding to your itinerary if you have the opportunity to do so. It's a bit of a treat in terms of the price but it's a destination that's certainly worth a visit plus make sure you allow yourself enough time to take in the delights of Watergate Bay whilst you're there as well. As a lot of my Cornwall tales so far have been concentrated on dog friendly locations it's worth mentioning that you aren't able to take your furry friend to Fifteen as it doesn't have any outside space and understandably they aren't allowed in the restaurant. So this is one for you to enjoy sans four-legged friend but is still worth the trip as a treat for the humans! I'll be back very soon with part two of my Cornwall series - if you missed part one you can find it here: Tales From The Cornish Coast: Part One. In the meantime have a very happy Thursday and hope to see you back here on the blog very soon.